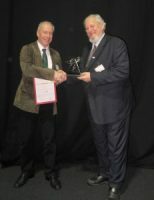 The first European Geothermal Innovation Award was presented to Jörg Baumgärtner (Bestec) by Burkhard Sanner (EGEC) at GeoTHERM. He thanked the finalists- the endorsed nominees- saying “these four companies showcase the innovation power that exists within all fields of geothermal energy.” He added “I look forward to reviewing many more excellent nominations for next year’s award”. BESTEC (DE), for their contribution to the development of commercial EGS projects. Exergy (IT), for their Radial Outflow Turbine for geothermal binary plants. Zorlu (TR), for the Kizildere Phase II plant, which has a binary unit and supplies district and greenhouse heating. Designed as an opportunity for industry peers to acknowledge excellence, and for the most exciting ideas to be widely publicised, the European Geothermal Innovation Award is the seal of excellence applied to the most intelligent and important ideas in research and industry which will play a key role in the future development of geothermal energy. The jury for 2014 was composed of Victor van Heekeren (The Netherlands), Adele Manzella (Italy), Ladislaus Rybach (Switzerland), Burkhard Sanner (EGEC), and Sandra Kircher (Messe Offenburg). The European Geothermal Innovation Award 2014 is an initiative from The European Geothermal Energy Council in collaboration with Messe Offenburg, organisers of the GeoTHERM fair and congress.